Zoo Town Throwdown - Let's Throwdown! Let's get some house cleaning done. Full squads from Northern Rockies, GAS, Delphine, and Five Valley Velo. 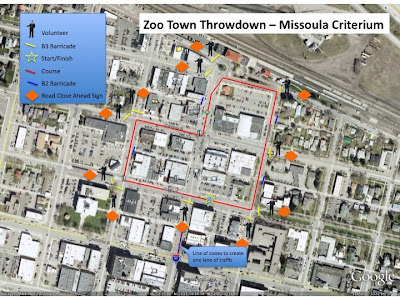 Will the Zoo Town Title stay in Missoula or will another town steal the show. Non-stop action 11am - 6pm. If you missed out on this race, mark it on your 2010 calendar right now. For a late season Montana race, the field was pretty good. As the local team, GAS had a great contingent, but the big showing came from the out-of-staters. Washington, Idaho, Wyoming, Colorado, Ohio, New York, and Canada were all well represented. Going into the final stage, Sam Krieg (Bobs Bicycles) had a strong hold on the leader's jersey thanks to an impressive time trial win, and a podium spot in the street sprints. Michael Emde (Emde Sports) and Matt Seeley (FVV) rounded out GC top three, which meant moving up in the GC was going to take a big result, as these three riders are hard to beat on any day. I was sitting pretty far down on the GC, so the plan was hit an early break with some riders that weren't way up on the overall. If I could hang on to the finish, take the win, and get a few guys between myself and the contenders to steal some points, that might give me a chance to move up on the overall. With a downhill start, the chances of sneaking off without blowing too much energy wasn't bad. From the gun, there were a couple of attacks, and I wasn't quite quick enough to react. Eventually we all came back together and another flurry of moves went. This time I was on it, and with a well represented break (FVV, Emde Sports, GAS, NRO), the field was content letting us roll. Unfortunately, the descent was short lived, and the climbing came fast. After a few miles the group was shed down to three riders,myself and Brian Frykman (GAS), and a man known to me as "Simmons" (GAS). After we hit the first few climbs, we worked together pretty well. We rolled pretty smoothly, trying to keep some strength for a strong charge to the finish in the closing miles. After nearly 50 miles off the front, we hit the turn around, and were quickly introduced to our fate, as we saw a group of 10 or so riders cruising only a minute back from us. We kept the tempo up, as we certainly didn't want to make the pursuit easy. It wasn't long before the capture was made, and I immediately stuck myself near the front of the group fully expecting a counter attack. I looked around and it seemed as though the field was content taking a minute to assess each other. I knew that any GAS riders in the chase group would have some pretty good legs since they wouldn't have participated in the chase, so I attacked hard hoping to draw them out. The field pretty much ignored my move, with good reason. After spending all day off the front, I was no longer a threat, and they knew they could chase me down. I got a small gap, and looked back to see Brian Frykman coming after me solo. So there we were again. Brian and I off the front. We rolled through a bit, but we were caught pretty quickly, and then Sam Krieg launched hard. Only John Curry (GAS) was able to hold his wheel, and the two of them motored away. Matt Seeley, Ben Hoffman (Rocky Mountain Chocolate Factory), and Kevin Bradford-Parrish were the only two other riders to react, and I took what I had left in my legs and stuck with them as long as I could. I can't speak for the finish, as I was off the back, but it sounds like Curry and Krieg had a great battle to the line, with Krieg taking the win. With over 5000 feet of climbing on the day, and temperatures well in the 80's, they both proved that they were the strongest riders of the day. Seeley, Hoffman, and Bradford-Parrish held on for 3rd, 4th and 5th respectively, while I drug myself in for 6th. Big thanks to Mike Longmire for the beer hand-up. 10. Having your kid enter the kid's race in full team kit. Mini Morgan represents, and so does McKenna. 9. Wearing another team's socks. Scotty Herzig rocks the Garmin socks and Tack's been known to slip in the Hagens Bergman socks. 8. Attacking for pure face time. Originated by Pipo Grove this lost art was refound by Brian Williams at Walla Walla, and Dale at last year's Tour of the Bitterroot. 6. Composite teams. While I can't give away too many surprises. There will be at least one surprise team. 5. Getting your name called over the loudspeaker. Matty Ice told me a story on the Tour de Jetsy. He said that after the crit at Walla Walla people came up to him and congratulated him on his victory. He did not win. His name was called so many times on the darn loudspeaker that folks had thought he won. That's what you get for being pretty and staying on the front. 4. Including your family in either your victory salute or on the podium. 3. Encouraging your teammates in other categories. This isn't the NRC, this is Montana. We are proud to be on our cycling teams. Let your teammates know it. 2. Being aggressive. Every 1,2,3 crit this year has been won on a breakaway. I wasn't at the Tour de Bozeman, but early reports are coming in and saying that it was an amazing event. Congrats to the Bozeman Racing Community for putting on an excellent weekend. Plans are already in the works for next year. Rolling Thunder Champ Sam Krieg showed up to do battle with MT's finest. Great work Bozeman promoters! I love this photo of Tack. He did not win the event, but Tack with a beer goes on the blog.